Every business is looking to increase website traffic. But, as many small business owners know, driving fresh traffic to your website is an ongoing uphill battle. 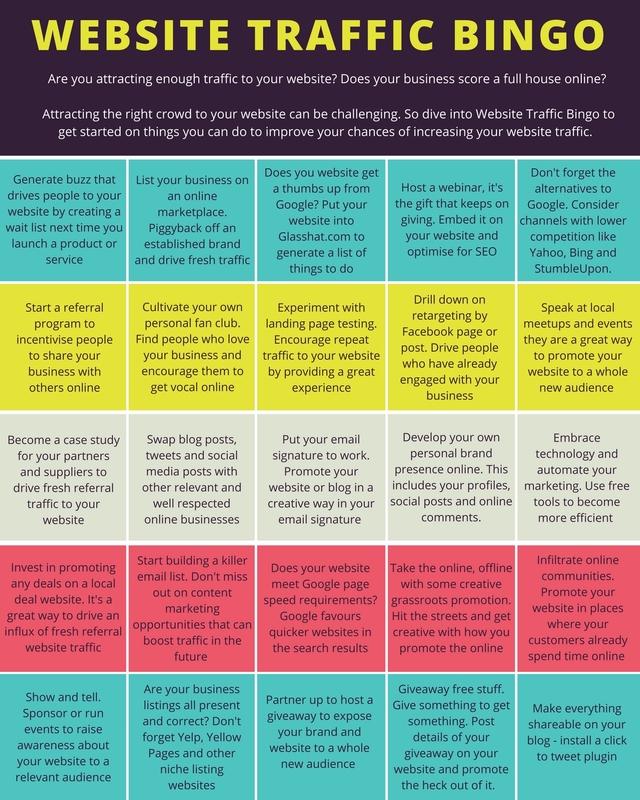 Enter website traffic bingo: the ultimate way to take on the challenge of attracting new customers online. We’ve come up with 25 creative and affordable ways you could put into practice to help increase website traffic. Arm yourself with ideas and get set to take on the challenge of boosting website traffic by completing as many of the ideas as you can below. 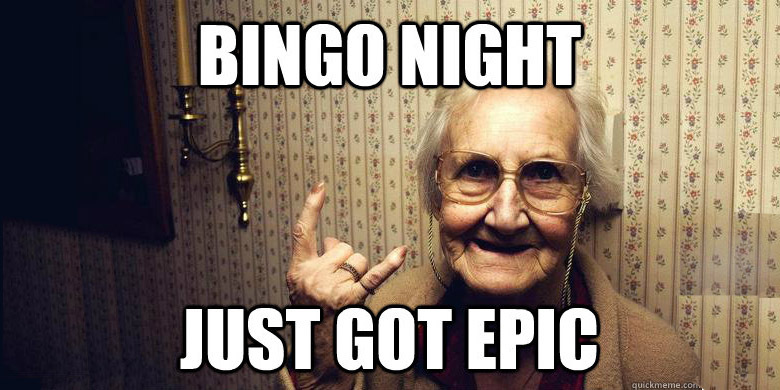 Can you score yourself a full house? Next time your launch a new product or service create a wait list to generate buzz that drives people to your website to register their interest. List your business on an online marketplace. Piggyback off an established brand that can help you to drive fresh referral traffic for your business. Does you website get a thumbs up from Google? Pop your website into Glasshat’s SEO planning tool to generate a full list of SEO things to do for your website. People love to learn, so host a webinar. It’s a great way to create valuable content that can be optimised and shared on social media. Don’t forget the alternatives to Google. Look for channels you can advertise your business on that have lower competition, like Bing, Yahoo or StumbleUpon. Register to speak at local meetups and events. They’re a great way to promote your website to a whole new audience that’ve never heard about you. Get smart with your retargeting by using Facebook Ad Manager to target people by page or post. Re-engage people who’ve already shown interest in your business. Get experimental with your landing pages. Visitors who have a good experience onsite are more likely to come back to your website as repeat visitors. Find people who like your business and believe in what you do and ask them to share the love on social media and online. People value peer recommendations more than an online. Could you set up a referral scheme to increase website traffic. Encourage your existing customers to promote and share your website with their friends and family with an incentive. Offer your review as a testimonial or case study that can be used by your suppliers or partners. It’s a great way to drive some fresh referral traffic from related website. Start building an email marketing list. Promoting your content and sharing news, offers and marketing material is a great way to entice people to visit your website and get new customers. Consider swapping blog posts, social media posts and advertising spots with other relevant businesses. Don’t forget that your personal brand presence matters online. This includes all of your social profiles, blog comments and contributions to forums. People may be more likely to visit your businesses website from a personal recommendation online. Use your email signature to promote your website. It’s likely you send lots of emails to prospective customers everyday – so don’t miss out on this opportunity to entice people to click through and find out more. Embrace technology and try out some marketing automation tools. They can be a cost effective and time efficient way to get more customers online. If you’re running a deal then consider investing some of your marketing budget in getting it listed on a deal website. They can be great for driving referral website traffic as well as expanding your reach and overall brand awareness. Are you quick enough for Google? Google ranks quick websites higher than those that are slow to load. Enter your website into a tool like ours to identify a list of quick fixes to speed things up. Take it back to creative grassroots promotion by getting out and about locally. Make a list of all the places your customers hang out online already and make sure you build up a presence there. Keep your eye out for opportunities that can use to send traffic back to your website. Sponsor or run a small event. Events provide a business with so many opportunities to promote their website, increase website traffic, create fresh content and engage with customer on social media. Audit all of your business listings and add in some new. Make sure your Google My Business page is all present and correct, and then move onto Yellow Pages, Bing listings, Yelp and other local business listing websites. This is a must for any small business who wants to improve their local SEO. Partner up to host a giveaway. If you’re a small business then you might not have the clout to entice people yourself. So hunt down a bigger partner, related to your business, that can help to expose you to a whole new audience. Giveaway free stuff. People love getting free stuff and this can be a simple way to entice them to visit your website to find out more, leave a review or even convert. It could be as simple as giving away small free samples, t-shirts or bags. Finally, don’t forget to make everything shareable. Make it easy for visitors to your website to share the things they find interesting with others on different platforms. Look at the range of ‘one-click’ share options you could get for your CMS. For more ideas on how to increase website traffic check out Glasshat – an SEO planning tool designed to make increasing traffic to your website the easiest part of your day. Try our free trial today.